Do You Think Your Child Is Ready For Music? 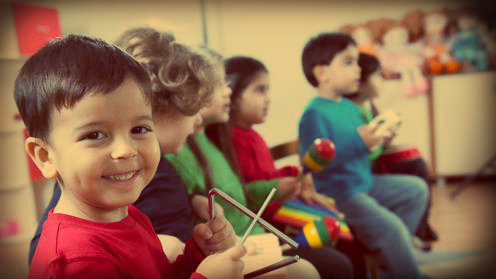 5 ways to know your child is ready for music. I have been teaching young children music for around 15 years now and I had to ask myself the same question recently, "When is my child ready for music lessons?" I knew because of research and experience teaching, but when I saw my own child demonstrate similar characteristics I knew what I told our parents all these years was actually true. Here are a few characteristics in comparison to watch for from your child to see if they are musically inclined. If you do not see these characteristics, don't worry your child might not gravitate to playing an instrument yet. It can sometimes happen over night though. Also, check out the video of a 1 year old that truly loves music and is ready to learn. Young children, screaming is another sign, unfortunately.. These are just a few characteristics to watch for. Be careful to judge talent level and interest together. Some parents have said to me "I am not sure my daughter is a singer, she rarely sings on key." This is dangerous thinking because some kids and adults might not have natural talent but can develop far more if they have interest, drive and discipline then someone who may be more talented initially. I hope this information was helpful. If you want to try out one of our free music classes click link below send us your info. We love teaching music and hope it shows!